Deseret News recently ran a story about Richardson’s Point, a historic spot in Iowa along the Mormon Trail. The graves of the first two casualties of the Mormon westward migration are found at Richardson’s Point. 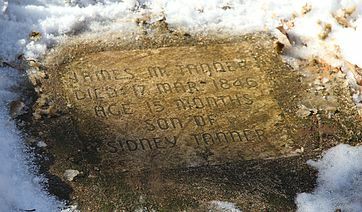 In March of 1849 toddler James Tanner fell off the tongue of a wagon and was killed when the wagon ran over him. The following day Edwin Little, a nephew of Brigham Young, succumbed to pneumonia and died, leaving his young wife and infant son to continue on without him. Always interested in history, this story made me wonder how the families of James and Edwin got on after their deaths. I did a bit of research. Louisa Tanner, the mother of the toddler who died, made it as far as Winter Quarters, where she died in September 1846. James’ father, Sidney Tanner, married a 17-year-old girl, Julia Ann, two months later. Julia cared for Sidney’s six children, bore him another eight children, and became a plural wife in 1859 when Sidney married Rachel Neyman. Sidney and Rachel had six children together, which gave Sidney a total of 22 children, including three who died in infancy. Edwin Little’s wife, Harriet Decker, had just turned 16-years-old when she married Edwin in 1842. She became a mother at 18, and a widow at 20. Harriet and her young son, George, went on to Utah after Edwin’s death, arriving in Salt Lake City on October 2, 1847. Harriet remarried a year later, becoming the first wife of the celebrated Mormon pioneer Ephraim Hanks. Harriet and Ephraim had seven children together, four being born before Ephraim entered into polygamy. On March 27, 1956 Ephraim (30) married two girls: Jane Capener (15) and Hannah Hardy (14). Hannah obtained a divorce from Ephraim two months later and waited until she was 24 to marry again, this time to apparent monogamist John P. Gibson. But Jane stayed in the marriage for 17 years, having seven children with Ephraim before getting a temple divorce in 1873. Jane went on to become the plural wife of her sister’s husband, Joseph Taylor, with whom she had two more children. Later, she left Joseph and, at the age of 50, married Thomas Giles, a widower who never practiced plural marriage. 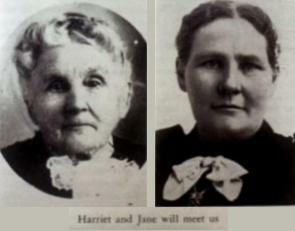 Like Jane, Harriet also divorced Ephraim Hanks in 1873. He had married a 4th plural wife, 15-year-old Thisbe Read, in 1862 (Thisbe’s records are inconsistent, but she noted her 1847 birth date in an 1897 affidavit). From that time forward Ephraim focused most of his attention on Thisbe, which resulted in what Brigham Young said was Ephraim’s neglect of his other wives and children. After Ephraim’s first and legal wife, Harriet, divorced him, he and Thisbe were able to obtain a civil marriage. They were legally wed on September 10, 1874. They had a dozen children, and remained together until separated by Ephraim’s death in 1896. Harriet tried to live the commandment of plural marriage, but in the end gave up the hope of exaltation to Godhood. Jane tried – twice – but she ultimately settled for a non-plural marriage, knowing Godhood was therefore out of her reach. Hannah, too, chose monogamy over an eternity of “bringing worlds into existence.” And Thisbe, while she married a man with two other wives and great eternal prospects (according to Mormonism), she ended up in a monogamous marriage with no hope of achieving Mormonism’s reward of exaltation to Godhood. Mormonism and its grand promises didn’t work for these ordinary Mormon women. How much better it would have been for them if they had trusted God’s Word and placed their hope and faith in Christ alone.